Here’s the latest near term EU threat to market stability – coming any time now to a market near you. After 2 German newspapers reported that Spain was seeking aid, now add a Spanish newspaper, El Economista, as the third to report a coming aid package for Spain, after 2 German papers reported this last week. All reports have been denied by the Spanish Government, which is rapidly losing credibility as the reports build. See details here from Bloomberg. Remember that just last week Spain had a 3 year bond sale at an average yield of 3.32%, roughly double the yield needed to sell 3 year bonds as recently as April, an ominous sign given that Spain needs to sell about € 25 bln in bonds in July. It is unclear how long Spain can continue to withstand a doubling of its borrowing costs, which will counteract efforts to cut its deficit. Spanish banking giant BBVA (BBVA) came out with very grim comments about the interbank market in Spain: Fin Min Ocana said “indeed it is a problem” that markets are closed to Spanish companies and banks, and the country needs “the markets to open.” BBVA Chairman Gonzalez said at the same conference that international capital markets are “closed” to most Spanish companies and banks. El Pais has some interesting statistics showing the huge reliance of the Spanish banking system on the ECB. While Spain’s share in the ECB is 9%, Spanish banks now accounts for 16.5% of direct ECB borrowing. The amounts borrowed represent a 26.5% increase over May. The paper quotes the chairman of BBVA as saying that the country urgently needed to tackle three issues simultaneously: sustainability of public finances, growth, and financial sector reform. Yesterday Spain was among a number of EU countries to again experience widening 5 year CDS spreads (measures extra cost to insure bonds against default and widening spreads indicate rising borrowing costs on future bond sales. This is a huge problem for Spain because it will be issuing € 25 bln in bonds in July, and increased yields it must pay counteract any benefit of spending cuts. 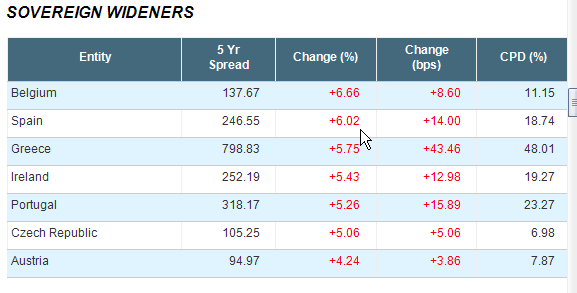 Note the table below on Spain’s 5 year bond spreads. Reggie Middleton noted here the same rising borrowing costs for Spain’s 3 year bonds, and that things are likely to get worse because, (surprise!) Spain has not been completely honest about the dolorous state of its finances. Now where have we heard THAT before (think of an image of the Acropolis with bouzouki music in the background). So what happens when Spain finally admits the truth.At minimum, risk asset markets would likely retest recent lows, and gold would likely retest all time highs. Spain’s economy and debt load is about 5 times that of Greece and owes so much to France ($220 bln, the equivalent of about 8.6% of French GDP), Germany ($238 bln- around 4% of German GDP), Britain ($114 bln) and Portugal ($28 bln, equivalent to about 10% of Portugal’s own debt load) that any doubts about Spain’s ability to repay risks casting further doubt on the major banks of these nations. See here for details from the New York Times.